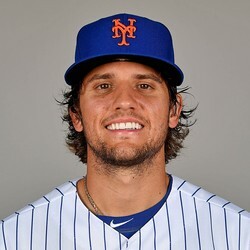 Cecchini provided a spark at the bottom of the New York Mets lineup. He had three hits in four at-bats, driving in two runs as the New York Mets cruised to a 7-3 win. With all the injuries in the Mets roster, the team is now relying on minor leaguers and veteran castoffs. Cecchini will continue to see regular at-bats in the last two weeks of the season, but his fantasy value is very limited. He has a career average of .235 with only one home run in 27 games of professional baseball.